Episode 27 | Episode 29 In this series of short videos, FFF president Jacob Hornberger summarizes and details the circumstantial evidence pointing toward the U.S. national-security state as the orchestrator of the assassination of President John F. Kennedy. Go to the podcast. Episode 26 | Episode 28 In this series of short videos, FFF president Jacob Hornberger summarizes and details the circumstantial evidence pointing toward the U.S. national-security state as the orchestrator of the assassination of President John F. Kennedy. Go to the podcast. Episode 25 | Episode 27 In this series of short videos, FFF president Jacob Hornberger summarizes and details the circumstantial evidence pointing toward the U.S. national-security state as the orchestrator of the assassination of President John F. Kennedy. Go to the podcast. Episode 24 | Episode 26 In this series of short videos, FFF president Jacob Hornberger summarizes and details the circumstantial evidence pointing toward the U.S. national-security state as the orchestrator of the assassination of President John F. Kennedy. Go to the podcast. Episode 23 | Episode 25 In this series of short videos, FFF president Jacob Hornberger summarizes and details the circumstantial evidence pointing toward the U.S. national-security state as the orchestrator of the assassination of President John F. Kennedy. Go to the podcast. Episode 22 | Episode 24 In this series of short videos, FFF president Jacob Hornberger summarizes and details the circumstantial evidence pointing toward the U.S. national-security state as the orchestrator of the assassination of President John F. Kennedy. Episode 21 | Episode 23 In this series of short videos, FFF president Jacob Hornberger summarizes and details the circumstantial evidence pointing toward the U.S. national-security state as the orchestrator of the assassination of President John F. Kennedy. Go to the podcast. Episode 20 | Episode 22 In this series of short videos, FFF president Jacob Hornberger summarizes and details the circumstantial evidence pointing toward the U.S. national-security state as the orchestrator of the assassination of President John F. Kennedy. Go to the podcast. 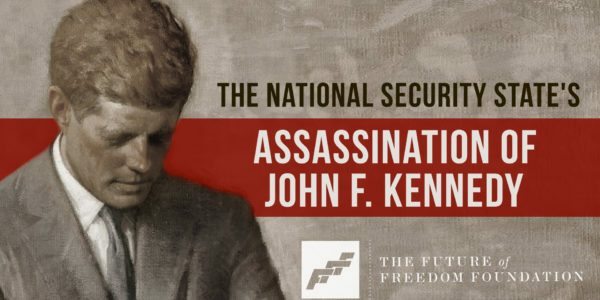 Episode 19 | Episode 21 In this series of short videos, FFF president Jacob Hornberger summarizes and details the circumstantial evidence pointing toward the U.S. national-security state as the orchestrator of the assassination of President John F. Kennedy. Go to the podcast. Episode 18 | Episode 20 In this series of short videos, FFF president Jacob Hornberger summarizes and details the circumstantial evidence pointing toward the U.S. national-security state as the orchestrator of the assassination of President John F. Kennedy. Go to the podcast. Episode 17 | Episode 19 In this series of short videos, FFF president Jacob Hornberger summarizes and details the circumstantial evidence pointing toward the U.S. national-security state as the orchestrator of the assassination of President John F. Kennedy. Go to the podcast.